Windows Phone 8.1 will be the first major update to Microsoft's mobile platform since October 2012. It will reportedly include highly-requested features such as a notification center and a virtual assistant to compete with Google Now and Siri, along with a slew of smaller fixes. The update will also reportedly bring Windows Phone closer in line with Windows RT, but it won't fully merge the two platforms. The long-rumored notification center--dubbed Action Center by Microsoft--will be a key feature in Windows Phone 8.1, and it reportedly takes some big cues from Android. Users will get customizable toggles at the top of the screen for things like Wi-Fi and Bluetooth, followed by a list of notifications grouped by app. Buttons for Clear all and settings also appear within the Action Center, and developers may be able to add, update or delete notifications silently as needed. One possible difference from Android: A long swipe is required to see the full Action Center, while a small swipe brings up just the quick-settings toggles. The latest leaks don't reveal anything new about Cortana, the virtual assistant widely expected to appear in Windows Phone 8.1. Bloomberg reported this month that Foursquare could play a large role, with Microsoft buying a $15 million stake in the location-based service. Microsoft itself told Bloomberg that it's "building some contextually aware experiences to power some upcoming products in Windows Phone." A report by WPCentral claims that Cortana will resemble a small blue circle, whose appearance alters based on what it's doing. Windows Phone 8 introduced a Data Sense feature for monitoring and setting limits on data usage. In Windows Phone 8.1, Microsoft will extend that concept with Battery Power Sense and Storage Sense features. The former will let users figure out which apps are sapping battery life and toggle a Battery Saver mode, while the latter will include options for moving apps and data to an SD card. 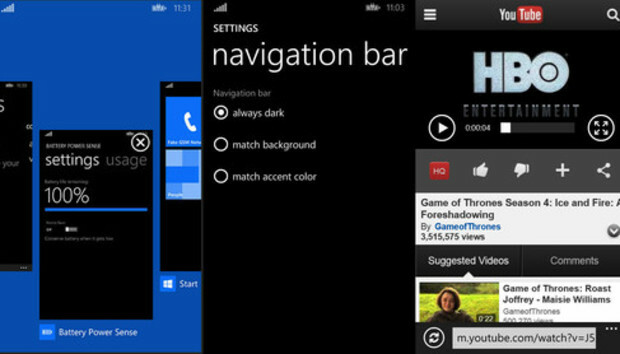 Windows Phone 8.1 users may have an easier time navigating the software, thanks to some possible usability changes. In the multitasking menu, users will be able to swipe away open apps instead of having to tap on a little 'x.' The master apps list will reportedly include options to sort by usage or install date, not just alphabetical order. In another nod to Android, new phones may be able to use software buttons for Start, back and search, and users may be able to change the color of this navigation bar. Microsoft is likely to announce Windows Phone 8.1 at its BUILD developer conference, which kicks off on April 2. A smaller update to Windows 8.1, dubbed Update 1, may also debut at the conference.